It’s that time of year! Parties are abundant and you need something quick, easy, and delicious to bring. We have you covered! 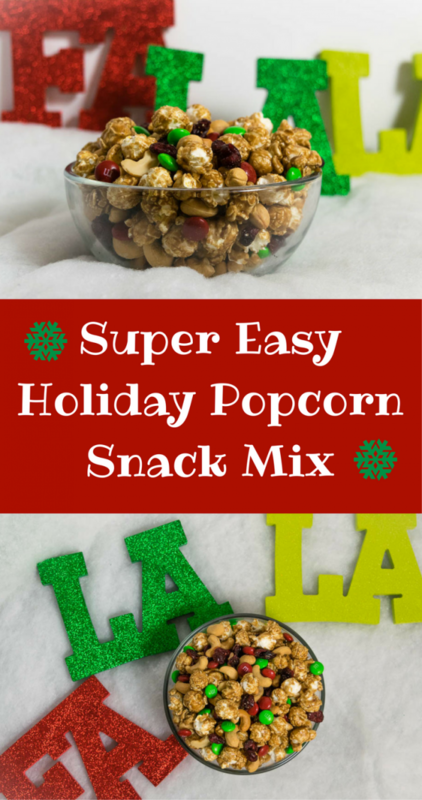 Our Super Easy Holiday Popcorn Snack Mix is just what you need. Not only is it quick to make, but it will keep everyone coming back for more! As the base for our Super Easy Holiday Popcorn Snack Mix we used Gaslamp Popcorn‘s Cinnamon Caramel Corn. If you can’t find it near you or don’t have time to order it in advance, you can substitute standard caramel corn. 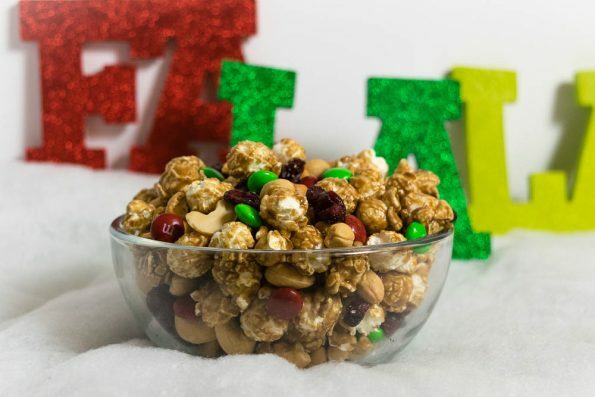 However, the Cinnamon Caramel Corn really adds a bit of holiday flair to the mix. Gaslamp Popcorn started making their kettle corn in the historic Gaslamp District of San Diego nearly two decades ago. Since then they have grown and their delicious popcorn is now available outside of the San Diego area! For the store nearest you visit: http://gaslamppopcorn.com/locate.php. Be sure to visit our Instagram for a giveaway for 2 FREE bags of Gaslamp Popcorn! *The Geeks received samples of Gaslamp Popcorn for review and decided to use a portion as part of this recipe; All opinions are wholly our own. View our Disclosure Policy for more info. OMG this looks so delicious! I cant wait to make it! This would be perfect to eat while watching Christmas movies! What an easy, great sweet treat! I love caramel corn, and this sounds so yummy! Mmmm looks so delicious!! That Gaslamp Popcorn sounds delicous–need to try the recipe ASAP! Be sure to enter our giveaway on Instagram! We are giving away 2 bags of their popcorn! Great recipe, super easy and looks so tasty too! This looks simple and simply delicious! I love popcorn snack mixes BUT mine has to have cashews in them so I’m all for this recipe! We love throwing parties, around the holidays especially. And this is perfect! I might add salted cashews to ours, love the sweet salty combo. This sounds party perfect. Easy to throw together. Perfect for setting out in little dishes around the room for everyone to enjoy.